To select several items, hold down the Ctrl key on your Surface’s keyboard while clicking items with the trackpad’s mouse pointer or a mouse. Simple. Selecting items or groups of desktop items with your fingers, by contrast, can be one of a Surface’s most maddening chores. It’s fairly easy to select one item: just tap it, and Windows highlights it, showing that it’s selected. But when you tap a second item, Windows selects that item instead, deselecting the first. Open File Explorer and navigate to the drive or folder containing the items you want to copy or move to your tablet. Open File Explorer with a tap of its icon (shown in the margin) on the taskbar — that strip running along the desktop’s bottom edge. When File Explorer appears, examine the Navigation pane along its left edge: It lists all of your Surface’s storage areas. Tap the storage area containing your items; that storage area’s contents appear in File Explorer. Double-tap a flash drive, network location, or folder to open it. Keep digging until you’ve found the location of the item to be copied or moved. File Explorer lets you view items in many different ways, and Details view makes it easiest to select things with your fingers. So, tap the View tab along the Ribbon’s top edge and then tap Details in the Layout section. 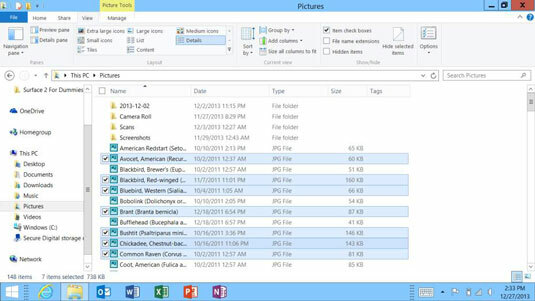 File Explorer displays the items in Details view: rows of names of files and folders. To select a file, tap just to the left of a file’s icon to make a check box containing a check mark appear next to the file’s icon. This is the trickiest part. With the tip of your smallest finger, tap just to the left of the file’s or folder’s name. When you tap in just the right spot, you place a check mark in the box that appears. As you quickly discover, this takes practice. If just one tap is off, Windows deselects everything and selects only what you’ve just tapped. Keep trying, and you’ll eventually find the sweet spot, just to the left of the icon. On the Start screen, a tap opens an item. On the desktop, by contrast, a tap selects an item. The desktop requires a double-tap — two quick taps in succession — to open an item. When selecting many items, it’s sometimes easier to tap the Select All check mark and then tap to deselect unwanted items. To delete your selected items, tap the Ribbon’s Home tab and then tap the Delete icon (shown in the margin). If you have a stylus for your Surface, it’s often easier to select and deselect items by tapping their check boxes with the tip of the stylus. You can also lasso adjacent items using your finger or stylus: Draw a rectangle around your desired items, and Windows selects them for you. After fiddling around with your fingers on the desktop for a few minutes, you see why a mouse, trackpad, or stylus can be invaluable for precision desktop operations.